As one approaches the tail-end of a splintering, cemented road, a red and white rusty-iron gate halts the free run of the car. Inside, a small grove of thick trees opens up to a large semi-concrete, semi-bamboo thatched house. The house is divided into two floors. On the upper floor, blue and white portraits of Jesus glisten against the shiny, bamboo walls in the afternoon sun. The ground floor in contrast, not as favourably disposed in matters of the sun, seemed rather dim. There was though a murmur of soft, escaped sounds of an instrument at work. It was the rhythmic sonata of a taat, or loom. Inside, it is a girl responsible for playing the taat’s music. She is weaving a bright pink and green cotton mekhela-chador. Barbie, 27, had spent the last seven days perfecting the garment. It usually takes about ten to fifteen days for a mekhela-chador to be woven, she tells me, but she as one of the more experienced weavers at the centre, was a day away from finishing the task. Traditionally, women of the Mishing tribe, learn the art of weaving as soon as their fingers are nimble enough. 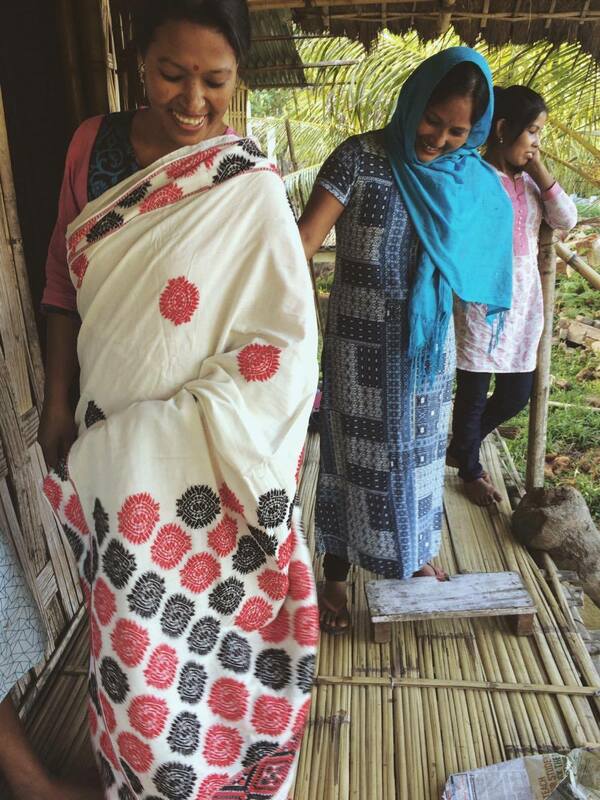 And so, many of the girls at this particular self-help group facility for weaving— I-Card- Life Plus in Jorhat, Assam, were from the Mishing community. The organization, whose name is expanded as the Institution for Cultural and Rural Development was established in 1998 as a Mishing apostolate. It is run by a Fr. K.A. Thomas with the help of Lolima Doley, who was the chief weaver and teacher at the centre. At present, the centre with a dormitory-style of accommodation has a total of 18 weavers, all females who are twenty five years of age and over. Most are college drop-outs recruited from Dhemaji and Lakhimpur regions of Assam, and at the centre, they get the opportunity to earn some cash by selling their products. In some instances, as they progress further with their art, some of them even get monetary assistance to branch out and set up their own taat homes. In the weaving room, Barbie shows me motifs that she would like to weave when she has her own taat. Lolima joins us. She explains the process of weaving that begins with installation of the loom. The hand-powered loom, also known as the throw-shuttle loom, is fitted to four posts dug deep in the ground. 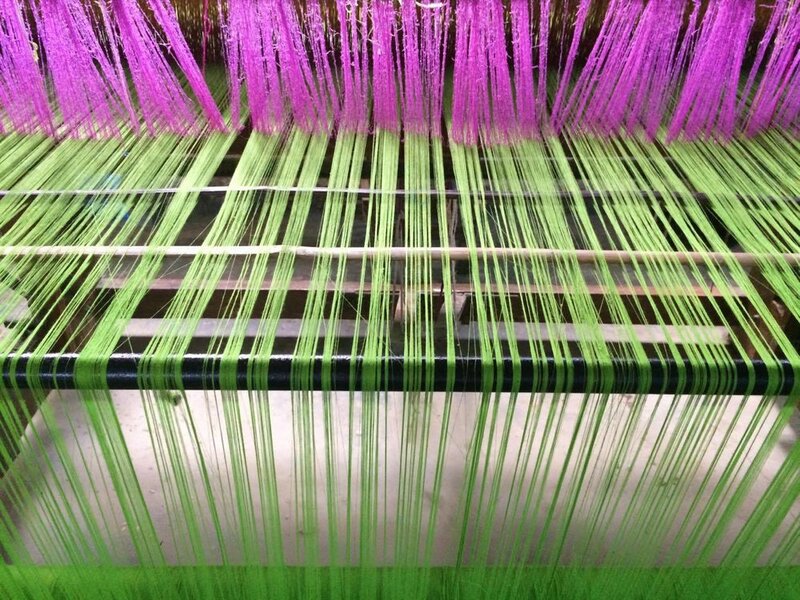 The cycle of weaving then consists of separating the yarn into an upper and lower segment, creating a some gap for the weft to easily pass from one side of the loom to the other. This process, known as shedding, is effected by a set of healts worked on by the foot. Next, the weft is beaten up with a bamboo reed attached to the sley. This synchronized process, when repeated in a cycle results in the unwounding of the warp beam and the wounding of the woven fabric on the cloth beam. The Mishing style of weaving is distinguished by the use of bright colours on their woven clothes, Lolima tells me in between this detailed, technical description of the process. As the textile tradition of the Mishing finds an audience beyond its own community, several innovations, as in the use of more colours and motifs, have seeped into their designs. Lolima, who has just returned from a month-long exhibition in Goa, tells me she had a good show there. On her trip back home, she had carried back only two leftover pieces from her initial collection. As we walked past the stilted huts that housed these young weavers, a group of girls gathered like a skirt around Lolima. After the hiatus of a few weeks, the girls had all sorts of stories and giggles to share. We all went inside one of the huts for some tea, or perhaps to share in spinning a yarn.